Man, going through the PGM has been productive lately. One of the reasons is because I finally picked up a copy of Stephen Skinner’s Techniques of Graeco-Egyptian Magic, finally, after way too long. Though I take issue with some parts of his analysis and contextualization of the material in the PGM, it’s still another solid resource for me to tap into, especially given how thorough he is with categorizing all the different rituals and parts of the PGM in a readable reference. There are things I wish I could have seen more of in the book, but on the whole, it was still a solid purchase to make. And, plus, relying on his organization helps point me into new directions to explore, or old roads to go down further than I have before. I’m also realizing how big PGM VII, specifically, is. This part of the PGM is huge, if not the hugest, and includes so much material, including (most of) the Homeromanteion, the Twenty-Eight Faces of Mēnē, some of the invocations to the Northern Stars and the Full Moon I make, lists of dates and signs for recommended magical or divinatory actions, and that recent Lunar Spell of Klaudianos I shared the other day. Lots of good stuff in there, amongst many other things to look at and try out. (It’s also the source for that ancient PGM meme of “grind up a pepper with some honey and coat your ‘thing'”.) 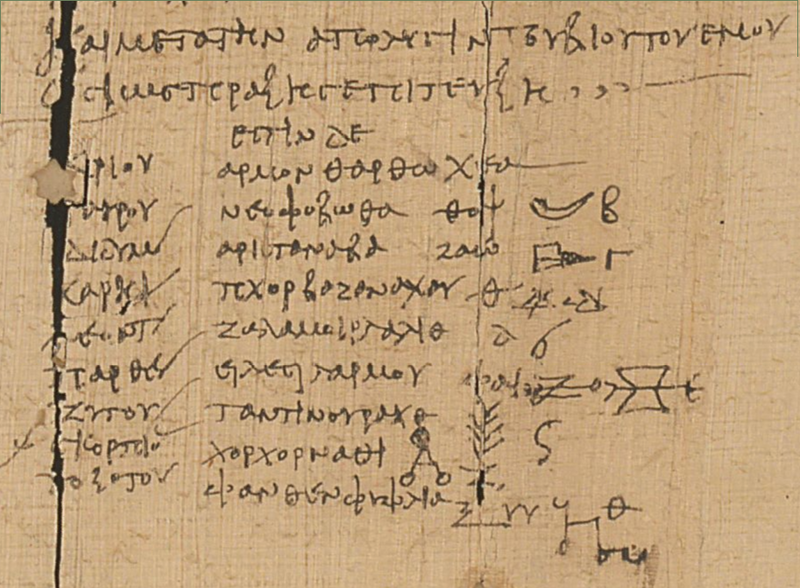 Well, one of the things in this text is PGM VII.795—845, titled “Pythagoras’ request for a dream oracle and Demokritos’ dream divination”; the attributions here are likely spurious, but then, so are most attributions to mythical or famous mathematicians or prophets in this sort of literature. This specific ritual is much like others: it’s a particular way to obtain divinatory or prophetical knowledge through ritualized dreaming by means of the angel Zizaubiō who hails from the Pleiades. What sets this ritual apart from so many other dream oracle rituals in the PGM is that this one relies on the use of a particular apparatus of a branch of laurel with leaves on it, on which you write a mystical name of each sign of the Zodiac as well as a magical character for each sign, one sign per leaf. This attribution of magical names and characters to the Zodiac signs is unlike anything else in the PGM; if there are references to the Zodiac, they’re usually direct and unmagical about it. To have a magical approach to these signs with barbarous words and characters would be a massive boon for deploying other kinds of zodiacal invocations or conjurations in the style of the PGM, but unfortunately, the list of characters didn’t…make sense at all. Some signs seemed to have several characters, others none, and some seemed to be clustered together in weird ways. I don’t like clutter or confusion, so I decided to sit myself down with whatever PGM source materials I could find, and do a bit of forensics and research to see if I couldn’t suss this out. Get a drink and strap in, because this is going to be a bigger post than even I’m accustomed to making; if you just want to see my results, skip ahead to the end. Otherwise, you get to learn how some of the words and characters from the original PGM documents got changed slightly from version to version through academia; I hope you enjoy! We can see that the Betz version of the characters pretty closely matches the Preisendanz version, except that the characters that suspiciously look like Greek letter-numerals to the right are instead interpreted, rightly so, as numbers. Fair enough; plus, we can kinda get a slightly better resolution idea of what these characters actually are. Note also the weirdness for Libra and Scorpio, how instead of there being two characters in two horizontal lines, one for each sign, there are two characters together, and it’s not clear how to distinguish which sign gets which character. Also note that Aries gets no character in either Betz or Preisendanz, which is odd. Most of the zodiac sign names are abbreviated, terminating with an upwards hyphen. Only Aries, Taurus, Scorpio, and Sagittarius are unabbreviated; Libra is there in full, but is marked as abbreviated. Capricorn gets a full slash rather than an upwards-hyphen, and Pisces gets a weird spelling and grammatical form (might just be a typo or mistranscription). A number of the characters, though similar, have subtle differences. There’s an extra character above the list at the end of the preceding paragraph (line 808). The second glyph for the Libra-Scorpio pair (with the upright sheaf-like character) does not have a Z shape under it; instead, it has a Zēta to the side, which is properly the Greek numeral for 7, with lowercase stigma above it for the numeral 6. Still, though, we have these two characters side by side again. The character for Sagittarius is radically different. Even noting Kenyon’s reuse of similar-looking letters for characters based on graphical similarity, we can’t help but be caught off-guard, especially with the separator of spacing and a middle dot in there, too. The Greek numeral 4 (represented by the letter Delta) is clear in Kenyon, but look at how deformed it is in Preisendanz as the rightmost character (line 813). The Greek numeral 5 (represented by the letter Epsilon) is joined into the rightmost character for Virgo (line 815); note how it’s also conjoined in Preisendanz, but not in Betz. However, Virgo should be the sixth sign, not the fifth, which is Leo. Yet, Leo (line 814) doesn’t have an Epsilon, but a funny-looking squiggly-b letter both in Kenyon and Preisendanz. Something got mixed up here. The numbers for the signs are clearly labeled on the right as separate letters, though oddly Ēta (8, for Scorpio) and Iōta (10, for Capricorn) seem to have been skipped. Alpha (1, for Aries) is actually present, just put on the end of the mystical name for Aries (line 810); Preisendanz makes this clear. The esoteric names for Aries (line 810) and Aquarius (line 820) do not have spaces in them. As for the footnotes Kenyon has for the transcription, only one is pertinent to this excerpt, line 819: “αιγογερ- : so, for αιγοκερ” (referring to the abbreviation for Capricorn, Aigokerōs (Αἰγόκερως). The long arrow-like symbol on Kenyon’s line 808 could be the character for Aries, though its placement in Kenyon is weird. The weird squiggly-b symbol to the right of the character for Leo on Kenyon’s line 814 should be interpreted as a Greek numeral Epsilon, because this is the fifth row/sign/character we get. This means that the “conjoined-epsilon” on the right character for Virgo on line 815 is actually part of the character, because it doesn’t make sense for Virgo to be given the numeral 5 when it’s the sixth sign; instead, the stigma (Greek numeral 6) put to the upper side of the sheaf-like character on the next line down should be considered Virgo’s numeral. The positioning of the last three characters for Capricorn, Aquarius, and Pisces in Kenyon is a little weird, but the numerals for ΙΑ (11, for Aquarius) and ΙΒ (12, for Pisces) help significantly. It’s weird that we don’t see a single Iōta for the character for Capricorn, however, but given its vertical placement above the latter two characters, it’s safe to assign this character to Capricorn. If that’s the case, however, then we would expect to see an Ēta somewhere to clearly delineate that the left Lambda-like character goes to Scorpio, but instead, it appears to be entirely missing from the diagram. We should look for something that resembles an uppercase H, maybe with a loop connecting the right end of the horizontal bar and the top end of the right vertical bar. The biggest issue we’ve got, then, is the weirdness for the characters for Sagittarius and whether it might be hiding any letters that would act as an Ēta (to distinguish the sign for Scorpio) and Iōta (to distinguish the sign for Capricorn). As given in either Betz, Preisendanz, or Kenyon, the character (or characters) for Sagittarius are the most complex and confusing, and something here isn’t what it seems. Now we can get some more answers! The character for Capricorn is slightly less embellished in the scan than in Kenyon: note the lack of ring-marks on the vertical bottom end and horizontal left end. However, there is still no Iōta present to mark the character, breaking with the rest of the pattern. Besides that, however, the characters for Aquarius and Pisces are, indeed, made clear by positioning. At least some of our questions can be cleared up at a glance. Okay, so, with the information we now have at our disposal, let’s go down our problems one at a time. 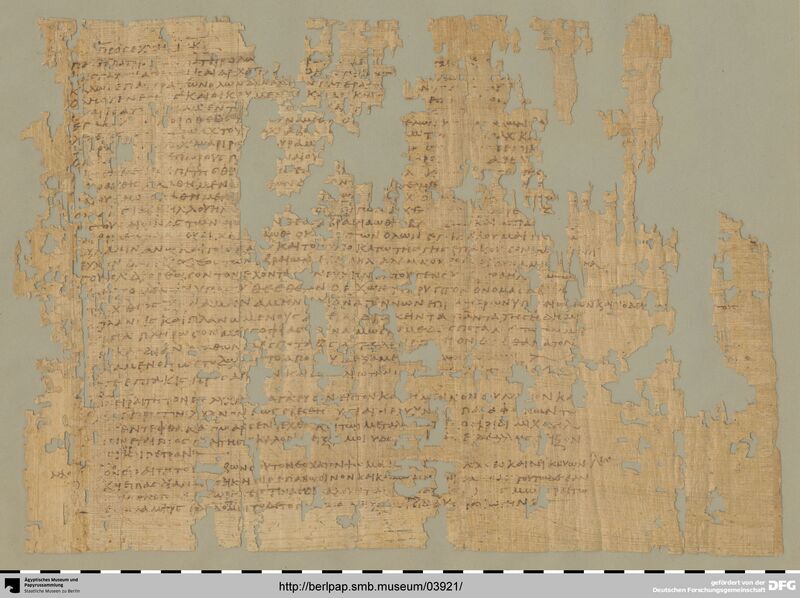 What we need to do is try to decipher not only the text here, but we need to figure out the intent and mind of the original author of the papyrus. This is a minor issue, but an issue nonetheless for me. How the name for Aquarius should be spelled is a little complicated; Preisendanz and Betz give it as ΜΕΝΝΥ ΘΥΘ ΙΑΩ, while Kenyon gives it as MENNYΘΥΘ ΙΑΩ. The scan is clear that there is definitely no space between ΜΕΝΝΥ and ΘΥΘ, so those two should be a single name (though I understand Preisendanz’s reason for splitting ΘΥΘ off under the influence of the god Thoth). However, whether the final ΙΑΩ should be separate is debatable. ΙΑΩ is definitely a common name in the PGM, that can’t be denied, and there is a pattern of other names that have two parts (Taurus, Gemini, Virgo) to have a second part composed of only three letters. However, unlike those other names, there isn’t a huge space between MENNYΘΥΘ and ΙΑΩ. 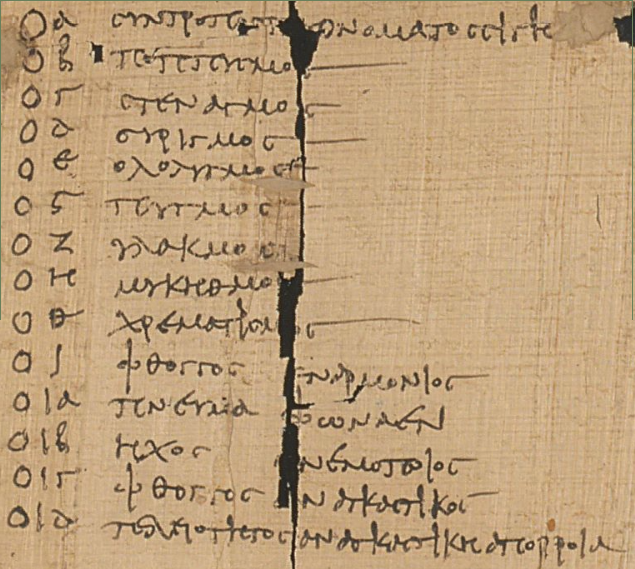 The only indication that there should be a space read here is that the final Thēta of MENNYΘΥΘ doesn’t connect with the Iōta of ΙΑΩ, and the handwriting of the author always (as far as I can tell) connects the horizontal bar of Thēta with the following letter in a non-final position. Given that, it can certainly be argued that this name should have two parts, but it can go either way. So, the name would be MENNYΘΥΘ ΙΑΩ (two parts) or MENNYΘΥΘΙΑΩ (one part). Going down the list, we would expect one numeral per line-sign-character: Alpha for Aries, Bēta for Taurus, Gamma for Gemini, and so forth. Largely, this is true, but we have a bit of an issue when we look at Cancer, Leo, and Virgo. We would expect, in order, Delta for Cancer, Epsilon for Leo, and Stigma (which was commonly used in lieu of Digamma for the number 6) for Virgo, and indeed, all these numerals appear, but not exactly where we see them. The line for Cancer has two characters, a Thēta-like character with a long horizontal bar that swishes from the lower left to the upper right and a sort of wide Delta-like character with an upwards slash going through it, followed by a normal Delta though with a weird angular bracket between the slashed-Delta character and the Delta-numeral. This might indicate that the bracket is part of the characters for Cancer, but let’s keep looking. As far as that Thēta goes, it’s spaced out far enough from the rest of the name that I’m pretty sure it’s not part of the name, and it forms a character unto itself. Leo posits more of an issue, however. We see two glyphs to the right of the name for Leo: what looks like a plain old Delta (though it also looks like a Roman cursive lowercase “a”), and a sort of 6-like glyph. We would expect to find an Epsilon at the end of this row to act as the numeral 5, but we don’t. Instead, we find an Epsilon glyph at the end of the second character on the following line, and based on how the horizontal bar of the Epsilon doesn’t match up with the horizontal bar of the character, it seems like this truly is a separate glyph, indicating that that character is marked as for the fifth row. That said, it occurs right to the side of the other character within the same row for Virgo, which should get the numeral for 6 (which would be Stigma), and we find Stigma immediately under and centered beneath it. I’m pretty sure the vertical-sheaf character is the seventh character for the seventh sign, Libra, and we see the numeral for 7, the Greek letter Zēta, placed immediately under and centered beneath it. Additionally, almost all the signs have exactly one glyph that acts as its given character; the only exceptions are Aries and Cancer, and both of those are still debatable at this point, and whatever is going on with Sagittarius. Given that, I would say that the cross-loopy-Z character is the proper (and only) character for Virgo, while the arrow-hourglass character is the proper (and only) character for Leo. However, if that’s the case, then we end up with a problem: what to make of Cancer’s Delta-numeral? We find two Delta-numerals, one to the right of the characters and one under them; there’s also the slashed-Delta which might or might not be part of the characters for Cancer along with maybe the angle bracket, and we still have that weird 6-like glyph on the line for Leo. Given that the Delta on the line for Leo is definitely and clearly a Delta (compare its form to the “εστιν δε” above the list), I’m inclined to think it’s just a numeral to refer to the characters for Cancer on the line above. This would make the Delta above extraneous, however, and I’m inclined to think that the author slipped up several times here: the slashed-Delta was originally going to be the numerical reference for this line, but it didn’t line up with the numerals Bēta and Gamma from the prior two lines, and it got crossed out and replaced with another Delta to the side, but then that made it messier, so he added another Delta underneath the Thēta-like character to make it clearer what the actual character for Cancer was. The 6-glyph, then, would be a typographic mark to indicate something amiss here, either to link the Delta-numeral on the line for Leo to its proper, original placement on the prior line, or to “negate” that line’s space and direct the author/reader to look on the next line for the expected character. I’m pretty sure that the 6-glyph isn’t a character for any of the signs, because it also doesn’t fit in with either the style of the characters, any of the letters, or any of the numerals. The vertical length of the sheaf-like character makes it difficult to squeeze into the tight rows of the text. However, given its height and positioning, it seems like it should be given clearly to Libra, especially since it has the Greek letter Zēta immediately beneath it for the number 7. However, I have one issue with how it’s drawn in Kenyon and Preisendanz/Betz: the four inverted chevrons are connected down the middle with a vertical line, but how far that vertical line should extend seems debatable. Kenyon has the vertical line extending past the top chevron and below the bottom chevron, and all unconnected to its Zēta numeral; Preisendanz has the line stop at the vertex of the topmost chevron, extending past the bottom one, and in contact with the Zēta numeral; Betz has the line extend past the bottom and top chevrons and coming in contact with the Zēta numeral. The scan is pretty clear that the vertical line should not extend past the vertex of the top chevron, but there’s a crack/crease that makes the rest of the character hard to read. It doesn’t seem like the character should come in contact with the Zēta numeral; not only does it seem like there’s an absence of ink that would connect the two, but no other characters are graphically connected to their numerals. Looking closely, however, there is a faint vertical line that connects the chevrons together by their vertices, but it doesn’t seem to extend past the top or bottom chevron. So we have a good idea of what this character should actually look like. This leaves the Lambda-like character to its left; given its smaller size, it seemed easier to slap it right next to the name for Scorpio, and the graphical placement really does make it clear that it’s this that’s the proper character for Scorpio, indeed. Taking a closer look at the scan, it looks like a proper capital Alpha with two ring marks on the terminals of the legs, and a large ring mark at the apex that seems blurrily filled in. Kenyon preserves the horizontal bar of this character and shows a larger-than-usual apex ring mark with a cross inside, while Preisendanz/Betz do away with the horizontal bar and leave the apex ring mark small and empty. It seems clear to me that the horizontal bar really should have stayed in, but it’s hard to make out what exactly is going on with the apex ring mark. However, we’re still missing an Ēta somewhere here, which is what we expect since this would be the eighth sign and every other character-sign so far has a numeral attached to it. It’s not present here, in teh previous line, or in the next line, so this leaves us with two options: the apex ring mark has something to do with it, or the author simply left it out. The former seems unlikely to me; though it does look messy, there’s nothing there that resembles an Ēta the way the author writes them, either in the middle of text or as a numeral. The latter seems more likely to me, since the context here makes it clear that this character belongs, and can only belong, to Scorpio. If we rule out that the mess with the apex ring mark has anything to do with a missing numeral, then it looks like the author made another mistake here and tried to fix it by going over the glyph again in more ink. Looking closely, it seems like there’s a smaller ring mark within the larger one, right at the actual apex of the Alpha-shape of the character. To me, this would indicate that the author originally drew the ring mark too big, and then tried to draw the smaller one inside in bolder ink to indicate that, no really, it should have been made the same size as the other two ring marks at the terminals of the Alpha-shape. So we have a bit of a mess with Sagittarius. The end of the line has a Thēta for the numeral 9, which is what we expect, and the glyph immediately to its left is definitely a character. Then we have the wide-bottomed Ksi glyph and the two Upsilon letters. Kenyon has that extra dot between the Ksi glyph and the Upsilon glyphs, but that looks like it belongs more to the Zēta directly above as punctuation more than anything else, and Preisendanz and Betz don’t accurately capture how these glyphs aren’t actually connected with each other. One thought is that these aren’t characters, but actual letters that should continue the name of the sign, so instead of it being ΦΑΝΘΕΝΦΥΦΛΙΑ, we could read it as ΦΑΝΘΕΝΦΥΦΛΙΑΞΥΥ. However, I don’t think that’s the case, because the Ksi here is written on a different baseline than the name itself with the upper-left terminal of the letter at the base height of the line for the name, and it’s way too angular for the author to write as a normal Ksi when compared with the rest of the text, where it’s a lot more squiggly and starts up at a higher point than x-height, as in the examples below (PGM VII.386, “ΠΟΘΗΞΑΣ ΕΡΑΤΕΥΝ” and PGM VII.504, “δοξασον μοι ως εδοξασα το”). So, if this angular-Ksi is indeed a character, as I think it could be, then the two Upsilon-chevrons to its right must also be part of it, as well. This seems weird to me, though, because this, when combined with the definite character at the end of the line before the Thēta numeral, would make Sagittarius the only multi-glyph character, and definitely the largest and most complex of them all. At the same time, looking through the rest of this author’s writings, the author rarely uses Ksi as a letter in his barbarous words, and it seems to be a phoneme that’s not comfortable in his own magical practice, especially when compared with the other parts of the PGM. Indeed, this author seems to have a much stronger Egyptian bent to his work than other authors elsewhere, so I suppose it would make sense that we probably wouldn’t see a more Greek-type of phoneme. Additionally, for a barbarous word of this length and style to end in a double Upsilon also seems unlikely to me. There is another possibility, however, that these three glyphs form a second part of the name unto itself. So, instead of reading it as ΦΑΝΘΕΝΦΥΦΛΙΑ followed by several characters or as ΦΑΝΘΕΝΦΥΦΛΙΑΞΥΥ followed by the one definite character, we could read it as ΦΑΝΘΕΝΦΥΦΛΙΑ ΞΥΥ followed by the one definite character. We already have three names for sure that are two parts, Taurus (ΝΕΦΟΒΩΘΑ ΘΟΨ) and Gemini (ΑΡΙΣΤΑΝΑΒΑ ΖΑΩ) and Virgo (ΕΙΛΕΣΙΛΑΡΜΟΥ ΦΑΙ), with Aquarius maybe having two parts as stated above (MENNYΘΥΘ ΙΑΩ). The extra long length of the bottom line of the Ksi could be to accommodate the spacing for the two Upsilon letters to its right as well as the Zēta numeral and the character for Scorpio directly above it, since getting all this to fit on one row would be overly cramped at this point. The angularity of the Ksi here is still a little weird, but then, the author has a tendency to make sharper/more defined the letters at the beginning of words or sentences (basically, capital letters), although it doesn’t seem like any of the names here are capitalized in the same way, and I can’t easily find an example of a Ksi starting a word in the text. So, for the name of Sagittarius to be a two-parter like Taurus, Gemini, et. al. is plausible, and would also allow us to maintain only a single character for Sagittarius like all the other signs. To be honest, I’m not comfortable with either choice, that there’s only one barbarous name for Sagittarius and it having several characters, or having two barbarous names, the second of which is pretty unusual for this author, with one character. However, of the two, the second seems more likely to me, because it fits in better with the pattern set by the other signs in this list with a mystical name that’s either one long part or one long part plus a shorter, three-letter part, and with each sign getting one character. If I were to bet on one place I’d make a mistake in this analysis, it’d be here, but I’m still comfortable with my choice of analysis, or at least relatively so when compared to the alternative. Though it’s the first sign in the list, I’m saving it for last because this is probably the most perplexing of the issues, even beyond the deal with Sagittarius. We know that the author of the papyrus tries gives the letter-numeral corresponding to the zodiac sign after the character for the same zodiac sign, either to its right if it can fit on the same line or underneath if there are space issues, with the sole exception of Scorpio with its character due to space constraints. The line for Aries doesn’t have a noticeable character, but it does end in an Alpha, which Preisendanz/Betz understands to be the numeral, but which Kenyon has as part of the name of the sign. However, the name here is already pretty long, and is broken down into several units by Preisendanz/Betz. There’s a crack in the papyrus in the middle of the final…glyphs of this line, between the (possibly) larger than usual Khi and the final Alpha, and Preisendanz and Kenyon are both in agreement that this cracked glyph should be a lowercase Epsilon. I would claim, then, that either the last one two glyphs before the final Alpha are not part of the name, but rather the character for Aries. So, we’d end up with the name ΑΡΜΟΝΘΑΡΘΩ with both the Khi and the Epsilon as the character, or ΑΡΜΟΝΘΑΡΘΩΧ if the Epsilon itself is the character. It can probably be established that my earlier theory was wrong, that the long horizontal arrow before the list was the missing character for Aries; it seems to be a sort of fanciful colon or continuation mark of the author rather than a character of a sign (and which is misrepresented in Kenyon, anyhow, as being three reversed “c” glyphs followed by a long horizontal line), especially given that we see similar signs elsewhere in PGM VII. This leaves us with the question: where does the mystical name for Aries end and the character (or characters) for Aries begin? There is a space between ΑΡΜΟΝΘΑΡΘΩ and the following Khi, but it’s nowhere like the other spaces for the other multipart names where there’s a very wide space, like for Taurus, Gemini, and Virgo. Moreover, the second part of those names always have three characters, while this one wouldn’t; we couldn’t separate the final Ōmega from ΑΡΜΟΝΘΑΡΘΩ because it’s visibly connected to the preceding Thēta. I’m also not confident that the Khi here is actually part of a separate word, because there doesn’t seem to be that big of a space between it and the preceding Ōmega; elsewhere in barbarous names and in regular text, the author doesn’t usually join Ōmega to its following letter, so the name here should be at least ΑΡΜΟΝΘΑΡΘΩΧ. However, the more I look at it, the less I’m sure that the final Alpha here actually marks a numeral rather than a plain letter. Note the long tail at the end of the Alpha; we see long tails in the text parts of the list of lunar symbols from the Twenty-Eight Faces of Mēnē text, and elsewhere where the letter can form a tail at all (like a final Sigma or final Epsilon), while the numeral use of Alpha doesn’t use a tail, there or elsewhere in the text. Between that and how…lax the letter is written, especially with the hypercorrect numeral-letters elsewhere in sign list, it seems like this Alpha should be part of the text and not marking a character, which would make Aries have the name ΑΡΜΟΝΘΑΡΘΩΧΕΑ. If the footnote from Betz is correct here, that ΑΡΜΟΝΘ is a rendition of Har-Montu, then we could explain ΑΡΘΩΧΕΑ as Har-Thōkhea, which…doesn’t seem to match anything I can find. However, there could be a metathesis of letters going on here; if we switch the Theta and Khi, we would get Har-Khōthea. It’s a stretch, but this could be a way to write Har-[em]-Akhet, better known as Harmachis, or “Horus in the Horizon”. Harmachis has appeared before (PGM IV.475—829, “Mithras Liturgy”) under the rendition ΑΡΑΜΑΧΗΣ, but there’s no way to explain the drop of the M sound in the name, so I’m not confident that that’s what this name is really getting at. There is the possibility that the author simply dropped the sound due to dialect or preference, but that’s a questionable assumption I’m not prepared to make. Either way, to read this name in any way like this would leave it with no character at all, making Aries the one sign without a character, which seems absurd here! Even if we were to read this name as something like Harmachis, we wouldn’t be able to explain the final Alpha anyway, so it really should be a numeral, though it’s not entirely clear what the character ought to be. There is the chance that the text simply never included a character for Aries, and I’m finding it hard to escape that conclusion, reluctant though I am to accept it. The only other alternative is that some of the letters in this name are the character for the sign; the author, elsewhere in this papyrus, has a habit of using Greek letters as characters, and it’s not always clear how to distinguish them, like in PGM VII.411—416. In the present text, though, it doesn’t even seem like the letters are spaced or delineated in any way that would suggest that they’re supposed to be used as characters instead of letters. That said, we do have a Thēta as the character for Cancer, and the long crossbar across it isn’t exactly unusual for the author when writing his Thētas elsewhere. If we leave the name of Aries here as ΑΡΜΟΝΘΑΡΘΩΧ, then we have the final ΕΑ to deal with. If we read the Alpha here as a numeral, ignoring the lack of spacing and how it looks like the middle bar of the Epsilon is conjoined with the Alpha in a way that looks pretty fluid and standard for the author, then we would use the Epsilon as our character. But…it still doesn’t seem like that’s the case, precisely because of those very aspects of the way this is written. It seems like ΑΡΜΟΝΘΑΡΘΩΧΕ or ΑΡΜΟΝΘΑΡΘΩΧΕΑ should be the full name of Aries, and even if the final Α seems weirdly written as a numeral, it still seems like it should be one all the same, giving us ΑΡΜΟΝΘΑΡΘΩΧΕ as the name for Aries. The only other alternative we have, then, if Aries is to have a character at all, is that weird triple-backwards-C with the horizontal mark from two lines before. It might be punctuation or “filler” for the rest of this column of text, but it doesn’t really seem like the author uses such filler when ending a column with extra space in the line, nor are these actual letters, and can’t be explained as such. The fact that it’s not present in the same line as the sign and mystical name for Aries is hard to reconcile, but assuming that the author wrote down a complete set of mystical names and characters for each sign of the Zodiac without any of them missing, then this is the only other thing I can think of that might fill that void. It being the first character drawn could explain its odd position before the author settled on an actual format when writing them down in an orderly way, but that’s a leap for me to make. Still, I see no other way to get around this without admitting a missing or forgotten character. 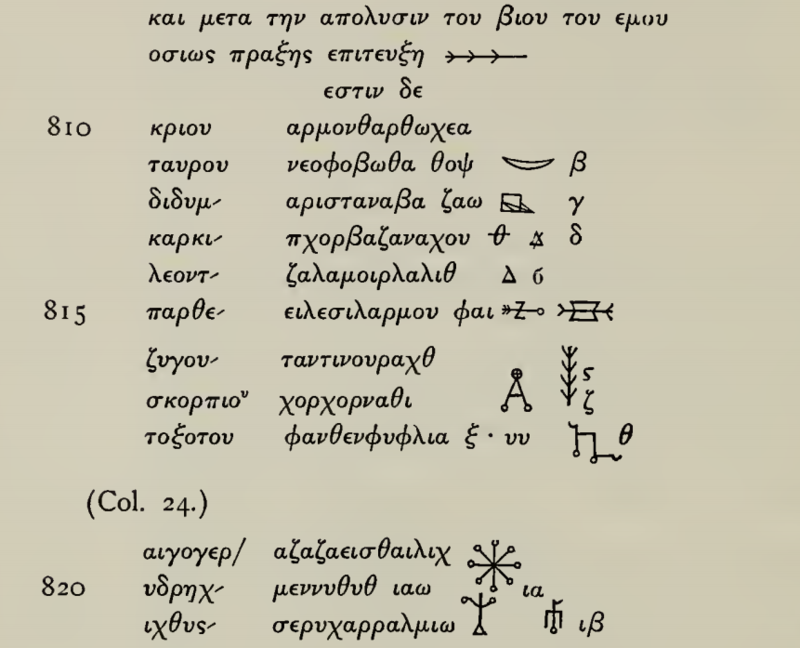 The only argument I have that this set of backwards-C-with-the-line characters are the characters we’re looking for is in that scan from PGM VII.411—416 above; note the backwards-C characters and the horizontal lines, which follow “ος αν βουλε” (“add the usual, as much as you want”) for writing on a scroll. This could be a kind of ellipsis, but I’m not confident that it is, and again, I’m pretty sure this isn’t line filler because the author doesn’t make a habit of that. Betz and Preisendanz don’t mention it in their versions of the text, but Kenyon does. For PGM VII.411—416, this would indicate that you’d write the string of characters first, then your request, then the terminal backwards-C-with-the-line characters. If these are indeed characters, then it would stand that we see a similar enough set of characters for Aries here, just in a slightly unusual place. That’s the only thing I can think of for this problem of Aries otherwise being character-less, but it would also make this sign of the Zodiac have a name and character that are disjoint, and there’s also the fact that this set of symbols does appear elsewhere in the text in unrelated parts, so I can’t say that this would be the actual character for Aries. Of course, there is one other argument which makes so much of the rest of this moot, which makes sense and actually works given the context yet which makes me incredibly frustrated: there is no true distinction between what we’d view as letters versus what we’d view as characters. The original text here doesn’t use the word χαρακτερ to refer to the things written at all, but rather ζωδιον, which we’d translate as “sign”. The difference here is nuanced and subtle, but bear in mind that none of these things are part of the spoken ritual, but are all intended to be written down on the leaves of laurel for the ritual. In other words, all that which is written is part of the zōdia, and is not necessarily meant to be decomposed into a speakable name and a writable character. In that sense, it’s not that Aries is missing a character, but it simply doesn’t have a non-letter part of its zōdion. I…I can’t deny that this makes sense, and does make the entire thing simple, but it also has its own weirdness (why doesn’t Aries have a character as part of its zōdion? ), and it frustrates me because it would still be great to have something that could be spoken and also could be written. The intent of the original author may be lost here, but it could be back-hacked to give us what we want, all the same. While this last argument doesn’t get us anywhere, I wanted to bring it up just in case someone wanted to take this idea further. The character for Gemini is unclear from the original PGM, and all subsequent authors have their own interpretation of how exactly to replicate this glyph. I’ve given several versions based on Betz, Kenyon, Preisendanz, and the original PGM (from what I can ascertain from it). The character for Libra has two versions: one with the vertical line descending beneath the last chevron, and one where it terminates at the vertex of the last chevron. Either may be used here. The characters for all the signs of the Zodiac are essentially the same as in the text, with the exception of Aries, which does not appear in the text. By interpreting the name of Aries ΑΡΜΟΝΘΑΡΘΩΧΕ as a corruption of Har-Montu Hor-em-Akhet or Montu-Harmachis, I decided to take the hieroglyphic spelling of the name and combining/corrupting them into something that resembles a character in its own right. Totally an invention of my own, I admit, but it seems like a good path to follow, until someone else smarter and wiser than me can resolve the issue of the missing Aries character in this part of the PGM. And, in case anyone wants them, I’ve also made versions of the line-fill glyph used just before this text and from other parts of PGM VII, both in a shallow-C and deep-C form, in case others want to use them as the character for Aries or for other uses. And there you have it! A set, largely intact and preserved from antiquity, of magical names and characters for the signs of the Zodiac based on PGM VII.795—845, with refinements from later transcriptions and critical editions of the original papyrus. I hope this lengthy analysis, with my own mixed-in conclusions and innovations, can be of some use to those who seek to extend the names and characters from this ritual into other uses. I would also like to give my deepest thanks to Dr. Kirsten Dzwiza of Universität Heidelberg and her excellent resource Charaktêres.com, an online database and series of publications that detail the location, use, function, and types of characters in the PGM and other texts, inscriptions, stones, and other works from the classical period for her insight and assistance in clarifying some of the sources to be used for this particular post. Well, now, that was a rather busy month of posts; with this, May comes to a close, the summer season informally begins, and I’ve rounded out this month with 13 posts, not a bad number, and it feels good to get back to the research and to the Work. That said, I really need to focus more on editing and refining my textbook on geomancy so that it’ll come out at some point during the next eon, so for the foreseeable future (a month or three), the number of posts is going to be scaled back to once a week, except and unless anything important pops up that needs to be known or shared with celerity. I’m still writing for the blog, of course, I’m just throttling back my output so that there’ll always be something to output. And yes, I’m still going to be around, so if you need me for anything in the meanwhile, feel free to leave comments on my blog or send me an email. Thank you, dear reader, for sticking around!